In 2015, I hosted a Happy Halloween Afternoon Tea Party and put some of my Halloween dishes and decorations to use. A white linen-look hemstitched tablecloth served as the base (Walmart), with black woven circular placemats at each setting (Walmart). 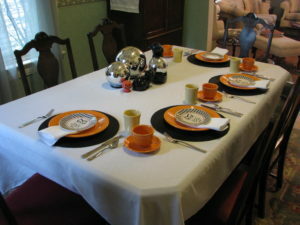 On top of the placemats are Fiesta Tangerine dinner plates (thrift store), topped by cute owl salad plates with a hounds t00th border (Living Quarters, Herberger’s) for the scone course. Fiesta Tangerine cups and saucers (thrift store) were for the tea, and water was served in the P86 Yellow Fiesta tumblers (J. C. Penney). Flatware is Little Hoot by Rachel Ray (QVC) and have a little owl on the handle. Matching white napkins finish each place setting. The centerpiece consisted of a black cat fishbowl holder (thrift store), mercury-like glass lighted orbs (QVC), an adorable black cat figurine that reminds me of my beloved Shorty (Herberger’s), and a pair of Fiesta Happy Pumpkin salt and pepper shakers to complete the Halloween theme (Betty Crocker catalog, now out of business). Water was served in my Fiesta Black Cat medium disc pitcher (Betty Crocker Catalog) and I used my Grandma Mayer’s silver plated tea pot to serve the tea. Happy Halloween Tea, October 2015. It was a fabulous meal topped off with a reading of “Faces in the Window” by Rose Wilder Lane.